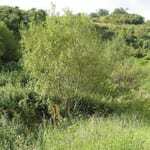 Grey willow can grow in places, where other trees would hardly survive. It can even grow partly submerged in water, which helps to stabilise the soil. They create wonderful habitats and nesting places for water birds and waders, like water-rail, willow warblers, coots or reed buntings for example. Like other willows, it provides food for many insects. The leaves are sometimes oval, sometimes obovate (egg-shaped with the base narrower than the tip), up to 9cm long and 2-3 times as long as broad. Though the shape of leaves is very variable, they are often widest at the top. They are narrower than the leaves of goat willow. They are greyish white below, they are not woolly like the leaves of goat willow and not as shiny above as most other willows. Like goat willow, they have a pair of ‘ears’ (stipules) at the base of the leaves which soon fall off. Catkins appear on separate male and female trees from March to April – before the leaves. 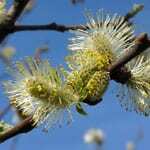 They are 2-3cm long, erect on short stalks and cylindrical, very much like the goat willow. Male catkins are grey, densely hairy and turn yellow later on. Female catkins are smaller, greener and more slender. They are both wind and insect pollinated. 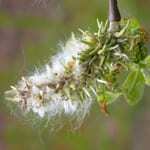 Female catkins turn into green fruits, which appear ‘fluffy’ in May and June, revealing their hairy seeds. The hair on each tiny seed helps dispersion by the wind, which, together with their quantity, aids their ability to colonise bare ground. Only fresh seed will germinate in moist soil for up to a fortnight from being released from its ‘mother’ plant, so it usually colonises wetlands nearby. It can, like other willows, grow from bits of branches dropped on the soil, so it has the added ability to spread along riverbanks. 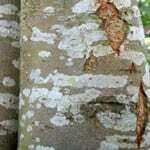 The bark is dark grey brown, fissured with age. Young twigs are slightly hairy with small ridges under the bark (seen best between 2 and 5 years of age). The buds are grey brown, smaller and more slender than those of goat willow. 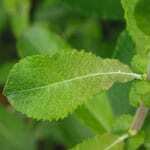 Willow wood in general is not in much use today, but willow bark contains tannins and salicin. Tannins help with digestion and salicin reduces a high fever. Grey willow is a deciduous shrub or small tree. It has a round or flattened crown, branched at the base. 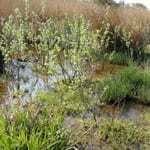 It grows in fens, marshes, along streams and in boggy or wet woodlands. It quickly colonises bare land and cannot tolerate dry land at all.